The editors are pleased to receive manuscripts written in English to be considered for publication in Shaman. All pages of the manuscript must be consecutively paginated. are referred to as figures and should be numbered in sequence with Arabic numerals. Each figure original should be identified with the figure number on the back, where the orientation of the figure should also be clearly indicated. Each manuscript submitted for publication should be accompanied by an English abstract of about 100 words that summarizes the conceptual content of the contribution. Eliade, Mircea 1964. Shamanism: Archaic Techniques of Ecstasy. Bollingen Series No. LXXVI. Princeton: Princeton University Press. Hamayon, Roberte 1994. 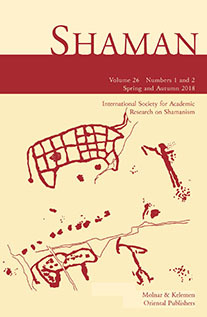 Shamanism in Siberia: From Partnership in Supernature to Counter-power in Society. In Nicolas Thomas and Caroline Humphrey (eds) Shamanism, History, and State. Ann Arbor: The University of Michigan Press. 76-89. Hultkrantz, Ãke 1961. A Definition of Shamanism. Temenos 9: 25-37. Technical terms can be given in any conventional system of transliteration or transcription, but the system should be consisÂ­tent. Russian should be transliterated following the system used by the Library of Congress (see also Chicago Manual of Style, 9.110). Chinese characters can be given in their Pinyin forms. Authors will be sent galley proofs showing modifications that may have been made in preparing their work for publication. No further proofs will be issued. Authors of articles will be supplied with 10 free copies of off-prints.